'New Moon' produces large, creamy-yellow flowers on strong upright stems. Good vigorous habit. In general, Globeflowers as they are commonly known, are striking perennials with ball shaped, yellow or orange cup-shaped flowers. They have basal leaves that have five lobes with each lobe divided into toothed segments that are lance-shaped. Use when bold colour is needed in a shady area. Trollius are native to damp areas of northern Europe and they make a nice addition to a pond or stream margin. 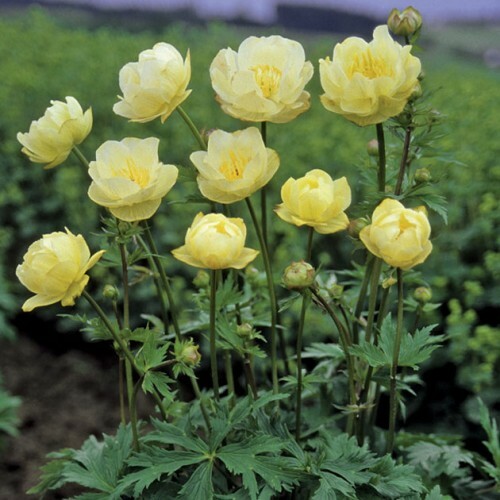 Watch the Botanus Garden Club video about Pam's Faves for Spring 2014 including the Trollius 'New Moon'!